We at Canada Curling Stone Co. are proud to manufacture our new curling stones from Trefor granite. We have the exclusive rights to the supply of this granite, making us the only company in the world making NEW curling stones from Trefor granite. Variety of options for start up clubs, arena clubs or clubs needing to replace worn out stones without the cost of going to new stones. Engineered to perform like a full size curling stone at only 25 lbs. 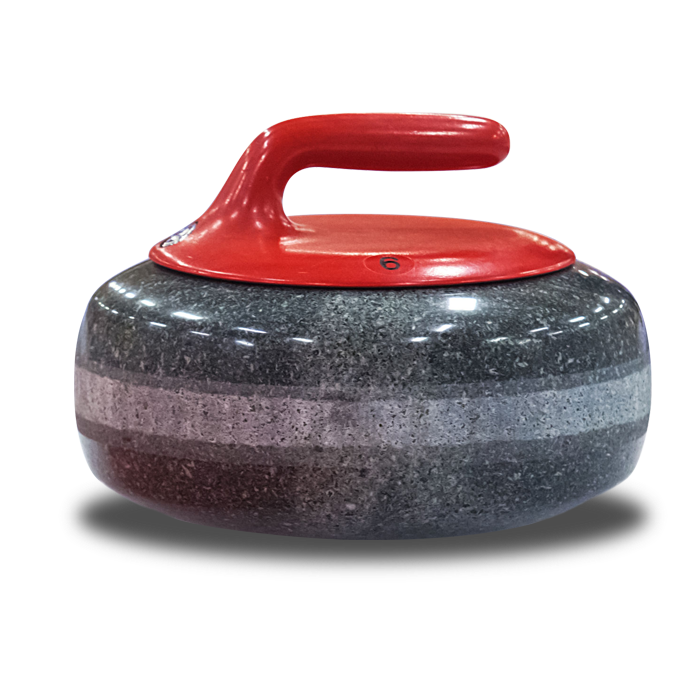 The perfect addition to any junior or learn to curl program. The most reliable handle on the market, Curlex handles are used in all levels of curling from club play right through to the World Championships & Olympic Winter Games. If your club is considering having work done on their stones and would like us to do an assessment of their current condition with recommendations based on that assessment, please contact Kimberly Tuck for more information. – The process in which a Blue Hone granite disk is inserted into a pocket that has been machined into the bottom of the stone. This procedure has been used in curling stone production & repair since the early 1960’s and was a way to deal with the poor ice conditions that were present back in those days. Removing a thin layer of granite to get to fresh granite, reconditioning the stones running surface will bring the running surface dimensions, shape and width back to current specifications and is the only way to fix stones that perform inconsistently. Most would consider the running surface of a curling stone the most important part of a stone, when in fact, the strikeband area dictates how much life is left in the stone and should not be overlooked. The condition of your strikeband has a direct correlation to what work can be done to the stone and how much action the stones have when they come into contact with each other. Canada Curling Stone Co. is always looking at ways to improve our product line with quality products that not only make the jobs of ice technicians easier, but products they can rely on. This is why we have added not only THE BOSS battery powered ice scraper to our line, but also two new scraper blades. In our new facility we have taken steps to create an in house blade sharpening and service area that is able to handle scraper blades, nipper blades and hand scraper blades focusing not only on the sharpening of the blades but the set up which is a key component to the performance of a new or new sharpened blade.If you would like more information on our blade servicing please contact our office.